How to make sabudana payasam recipe? sabudana payasam recipe is a delicious dessert and kids will like this recipe. Learn how to make with simple steps now. First wash the Sabudana in water and keep it aside. Switch on the stove and place a pan. Pour 2 ½ cups water in a pan, when it is boiled add crushed cardamom then add washed Sabudana. Allow it to cook up to 15 minutes until Sabudana becomes softer and bigger. After 15 minutes check Sabudana by touching it, whether it is cooked or not. Now add sugar and mix well the Sabudana payasam and cook up to 10 minutes until sugar become dissolved completely. In a fry pan add 3 spoons ghee, when it is heated now add cashew nuts and raisins fry till it become golden brown colour. Next pour the fried items in to the payasam and mix well. Now switch off the stove and take the Sabudana payasam then keep it aside. Heat the milk and pour ½ cup milk in to the Sabudana payasam and mix well at this stage check sugar . Now transfer the Sabudana payasam in a serving bowl. Hot, sweet, healthy and easy Sabudana payasam is ready to serve. Serve this payasam with masala vada it’s a nice combination. Instead of water you can use milk to boil the Sabudana; it will increase the taste. Adjust the milk and sugar quantity of your own. 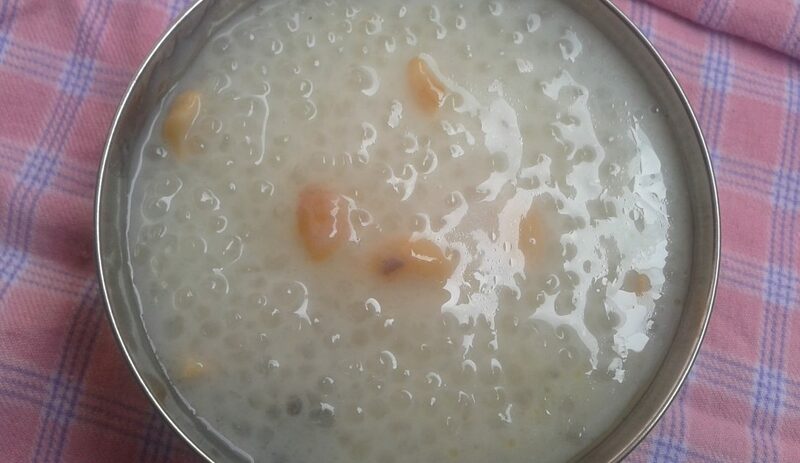 If you want the payasam watery means add more milk else use less amount of milk, as well as the sugar level also adjusted because of adding extra milk in the Sabudana payasam.